television footage may have been staged. 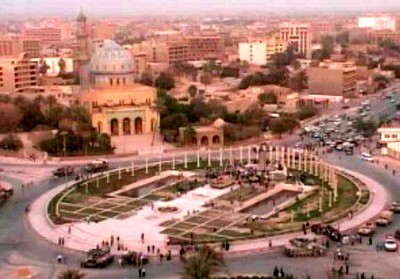 The photo shows the US tank pulling down the statue of Saddam. Last week, North Korea's foreign ministry logically spelt out the global lesson from this fraudulent invasion. They said, "The Iraqi war shows that to allow disarmament through inspections does not help avert a war, but rather sparks it", they further added "only a tremendous military deterrent force" can prevent attacks on states the U.S. dislikes. In spite of this obvious lesson, everywhere I turn today people are talking about how happy the Iraqis are to see the back of Saddam. They are all caught-up in the television coverage of 'Iraqi jubilation' and are dismissing the lessons of history. How else do they expect some people who have been traumatized for twenty-one days to react? The U.S. worked with the opposition militias in Iraq to get a few people to parade for this television footage. After America bombed the daylights out of the people what do they expect. Iraqis who survived the fury of America's Weapons of Mass Destruction and distraction, and witnessed the decimation of their country will not now show defiance to these brutal occupying forces. They know that opposition members and militias would be too eager to slaughter them. Some may jump extra high to demonstrate that they are on the side of the victors in the hope that their lives would be spared. This scenario has repeated itself so often in history that it should be expected. It is also expected that the Bush administration would use this footage for its own propaganda purposes. Those Iraqis who had some courage took up arms and fought. The rest were ordinary people who were fearful of both Saddam and the U.S. Iraqis have suffered for decades at the hands of European and American powers together with the tyranny of Saddam. One must remember that it is these colonial powers that armed Saddam and aided him in suppressing the Iraqi people. The colonizing powers were not interested in the people then and the excuse about liberation only came up as a last resort after failing to prove that Saddam had 'illegal' Weapons of Mass Destruction. That is how much they cared for the Iraqi people. Of course there would be Iraqis who would be genuinely happy to see the end of Saddam Hussein's rule. But I am sure that some in that small crowd of 'jubilant Iraqis' lost family and friends, and saw others maimed during the U.S. and U.K. bombings. So how happy can Iraqis really be. Remember that the CIA was also in Baghdad killing off those who opposed this US/UK invasion. If Bush is tossed out of the Presidency, we will see people worldwide dancing in the streets. Would this mean that Americans are being liberated? This also holds true for Blair in England; how many Britons would like to see him leave office. What about Howard in Australia and many other European misleaders? Who are they to speak of corrupt and brutal regimes with weapons of mass destruction when this invasion was another crime against humanity done with their weapons of mass destruction? When Europeans invaded Africa, some Africans cooperated with them and sold out family and friends in the hope that their lives would be spared. There were Jews who cooperated with Hitler out of fear. In the many countries Hitler invaded people came out in the streets and cheered. This is the classic conduct of repressed people. All these colonizing forces did was destroy food and water supplies and then bring in supplies to receive the cheers. Of course they ensured that their embedded reporters and media outlets carried this in their prime time coverage. This conduct started the long spell of mental enslavement in Africa where children were taught to suppress their feelings about these colonizing Europeans and to publicly smile and say what they would like to hear. Iraqis would now be entering another phase with attempts to mentally enslave them. They are expected to believe that opening up their country to the many U.S. vices, manipulative media and commercial exploitation is freedom for them. Many will not be allowed to express their disgust at any new puppet regime under the American style of 'democracy'. This is history repeating itself only this time the language will change while the conduct continues. Sure, the United States of America and Britain is winning this battle but by their very actions they have guaranteed that the cycle of violence will continue. They have done much to ensure that Iraq will be another Palestine. They have placed more British and American lives at risk and I hope they don't expect some Arabs who may come seeking revenge to discern between the actions of the U.S. government and its citizens. They will have to continually monitor and assassinate those who try to get them out of Iraq. And as Iraqi factions fight among themselves, The U.S. and other European countries would be negotiating away their oil. This is not new to U.S. foreign policy; this is the history of the United States of America. Today they are more brazen as they believe that no court can convict them and no military force can deter them while they rampage under the disguise of fighting terrorism. One must remember that certain U.S. and other European companies financially profit from wars. They sell arms to all sides. They need wars to test their equipment and to clear out old stocks while keeping their weapon industries commercially viable. The American economy depends on conflict and fear. Hell, there is no way they can stop now as they know without suppressing victims of their aggressions they will one day have to pay. But as the laws of nature have it, they will pay. They will pay when more people are armed with the facts of their history and start building closer ties with people who have historically suffered from such aggression. They will be standing on a moral high ground when their battle is waged from the awareness of what caused the decimation of African and other indigenous societies. Addressing the legacy of the Arab involvement in Slavery, which continues in several Arab and African nations, is a place to start. Addressing racism through a better appraisal of world history will build long lasting ties. Just remember, many Africans have been continually fighting both Arab and European racism and terrorism. We are survivors with a wealth of lessons for all sides.